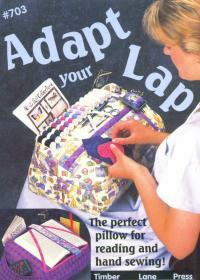 Give your knee a rest with this useful sewing or reading pillow! The top is slanted at a perfect angle and the bottom is sized to fit your lap. A rice insert gives stability, and handy pockets organize your supplies. The front handle hides the zipper which is used to remove the stuffing and rice pillow for washing. Great for sewing or reading at home or on the road! Measures about 10-1/2" deep x 14" wide x 4" high in front & 8" high in back. by Timber Lane Press.